Okay, I’ll admit it, I’m a sauce person. If you’ve read this blog for a number of years than you already know that. Heck, I even have a section in my cookbook dedicated to all of my favorite sauces and I joke that the reason we eat so many vegetables is because they’re usually tossed in a tasty sauce. These pork belly and kimchi bowls are no exception. I made a killer sauce that is so darn good it’s almost drinkable. I have to thank our good friends Colin and Kristin from Blue Bus Cultured Foods for the magic ingredient–Kimchi. I blended up some kimchi along with plenty of ginger, soy sauce, sesame oil, tahini and crushed red pepper flakes to create a delicious sauce. These “noodle” bowls are absolutely divine and while they call for more ingredients and a few extra steps than my usual recipes, please don’t let that discourage you. These bowls are worth it! I slow roasted a pork belly that I let marinate in a lovely sauce overnight. The whole house smelled amazing and while the pork was roasting I got to work with the rest of these bowls. I whipped out my spiralizer and made noodles out of turnips (you can substitute with rice noodles or even buckwheat noodles). Made that killer kimchi sauce, sautéed a few mushrooms, cooked a few soft boiled eggs and VIOLA! Best damn dinner we’ve had in ages. Also–the leftover pork belly tastes great panfried in the morning with a side of eggs and coffee. It’s literally the gift that keeps on giving. Local folks– I used a beautiful pork belly roast from our friends at Treebird Organics and I encourage you to do the same if you make this. If you swing by the famers market on Saturday you can get everything from the pork, eggs, kimchi and veggies to make this meal! Heck, you can even grab some beers from Full Sail Brewery so you have something to sip on while you prepare this dish! Cheers to local food and all the amazing people who support it! Preheat the oven to 450F. Remove the pork belly from the marinade (discard the marinade) and pat it dry. Place the pork belly in a roasting pan in the top third of the oven and cook for 30 minutes. Reduce the heat to 225 and continue to cook for about 1.5 hours longer (1 hour per pound of pork). When the pork belly is done roasting let it rest for about 10 minutes before slicing into bite size pieces. While the pork cooks prepare your sauce. Place all the ingredients into a high speed blender and whirl away until smooth and creamy. Taste for seasonings and adjust as needed. Place the turnip noodles in a large bowl and keep to the side. Heat 1 tablespoon of the toasted sesame oil in a large skillet over medium heat. Add the mushrooms and cook, stirring occasionally, until beginning to soften, about 3 minutes. Remove the mushrooms from the heat and add the remaining 1 tablespoon of toasted sesame oil to the same pan and add the turnip noodles. Cook, tossing occasionally, for about 3-5 minutes or until the noodles haves softened up a bit. Bring a pot of water to a boil, gently add the eggs and cook for 8 minutes. Remove from the heat and place in a bowl of ice water. When cool enough to handle peel the eggs. Divide the turnip noodles between bowls. 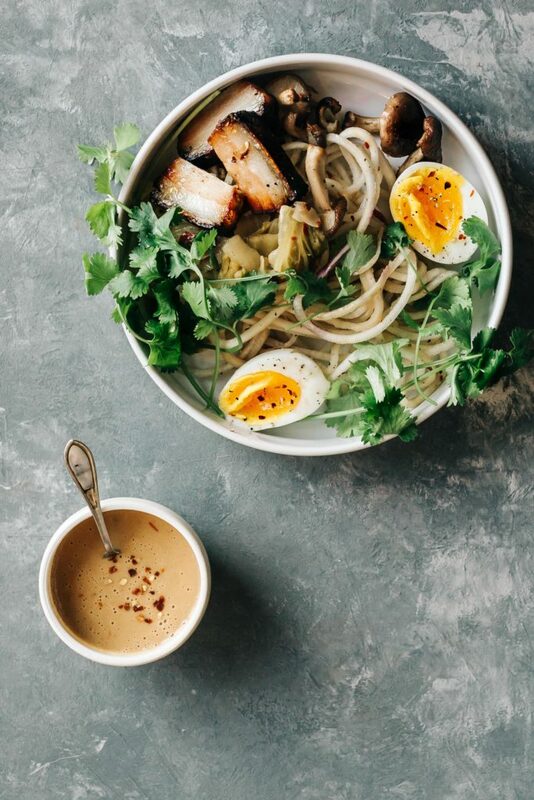 Top each bowl with some pork belly, soft boiled eggs, mushrooms, kimchi, and plenty of cilantro. Drizzle with the sauce and enjoy. I have to work up some confidence to do this one but none of your recipes have failed me yet so I’m gonna get myself psyched to do it and just jump in because I bet this will be our favorite too. Love me some good pork belly and this sauce sounds like perfection! This is my Dishing up the Dirt recipe. I used salmon instead of pork belly. Loved the sauce; so flavourful. This recipe was easy to make and didn’t require a lot of clean up afterwards. I’m so happy to hear!!! Keep on dishing it up!